13 and up. Children under 4 will not be admitted. 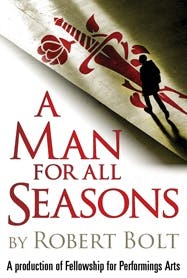 As Sir Thomas More refuses to recognize Henry VIII’s divorce and ascendancy as Supreme Head of the new Church of England, A Man for All Seasons reveals the risk of speaking truth to power and the clash that follows when fierce political will collides with deep moral conviction. A Man for All Seasons stars Michael Countryman (Broadway: M. Butterfly, Six Degrees of Separation, TV: The Path) as Sir Thomas More, with Carolyn McCormick (Broadway: Equus, TV: Law and Order) as his wife, Lady Alice. The cast also features John Ahlin (Broadway:Journey’s End, TONY Award) and Olivier Award nominee Kevyn Morrow (Broadway: Ragtime, Moulin Rouge spring 2019) as well as three-time Daytime Emmy nominee Trent Dawson (TV: General Hospital, As the World Turns), Drama Desk Award winner David McElwee (The Wayside Motor Inn), Todd Cerveris (Broadway: South Pacific, TV: Homeland), Kim N. Wong (Licoln Center: The Hard Problem, TV: The Deuce), Sean Dugan ( Broadway: Next Fall, TV: Smash) and Harry Bouvy (Wicked National Tour).